The first day at work, when a long –dreamed fantasy becomes a reality. All those who live the Sanfermin fiestas with passion, dream of immortalizing its face. The Running of the Bulls forms a core part of a range of experiences filled with emotions during the fiestas and, for anyone who loves photography, to work during this event is something almost magical. Miguel Fernández, a photographer from Sanfermin.com captured the image of a goring on his very first year at the photographer’s fencing. However, what he did not expect to find was that the runner on the receiving end of the bad goring was none other than a close friend of his: Juan Pedro Lecuona. 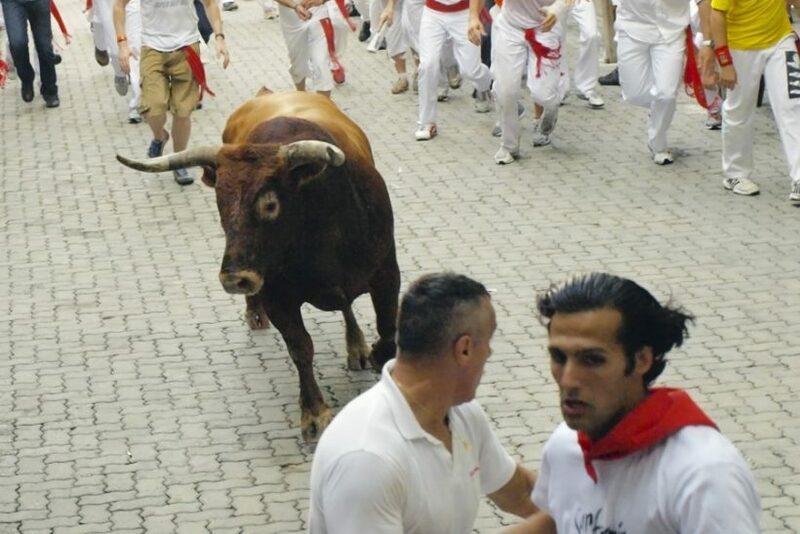 The bull, whose victim his friend was to become, is the one in the image that is racing down to the entrance of the bull ring in the photo. “This dun-colored bull is the one who gored my friend, Lecuona. It was a really awesome moment for me”, explains Fernández. Lecuona was trying to feign and slip away in front of the approaching animal now drawing closer and closer but his ruse was not sufficient and, trapped at the fencing, the horn of the bull plunged into his upper thigh and left a hole of some 25 centimeters.